It’s time to walk the talk on climate change. That’s the message activists communicated this week when they rallied outside New York City Hall on the fourth UN-backed Annual Climate Finance Day to demand that New York divest from its designated banks, which invest heavily in the fossil fuel industry, and create a municipal public bank. 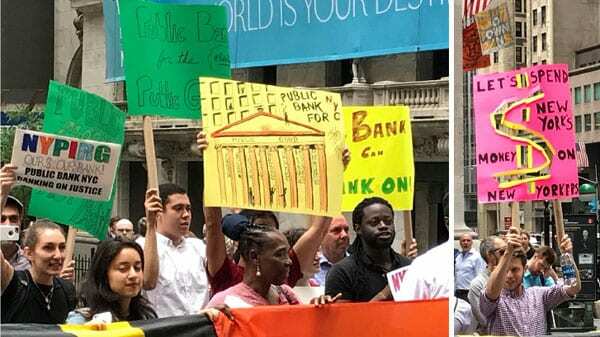 Public Bank NYC was joined at this rally by fellow community groups including NYPIRG, South Bronx Unite, the New Economy Project, New York Communities for Change, and Chhaya CDC. Jake Offenhartz of Gothamist writes, “Just about every major bank in New York City is complicit in fossil fuel financing.” New York does its banking with what’s known as “designated” banks, which are deemed eligible to hold NYC public financing by the NYC Banking Commission, a three-member body comprised of Mayor de Blasio, City Comptroller Scott Stringer, and Finance Commissioner Jacques Jiha. It’s unusual for the city to revoke the designation or remove funds, but it does happen, as when Wells Fargo as caught up in an account fraud scandal. Even some officials agree; Public Bank NYC quoted Councilman Mark Levine saying, “Our City should put its own money to work for New Yorkers through a public bank, which would supercharge investments in critical projects…and return financial power to the people and businesses that need it most.” Unfortunately, the people that most need investment are also the most at risk when superstorms hit the city. Mayor de Blasio has made some attempts to put New York on the map in the fight against fossil fuel companies, such as when ex-attorney general Eric Schneiderman sued ExxonMobil and other companies for damages related to climate change; the suit was dismissed, but other cities fight on. However, as with many social justice movements, activists are tired of the “we’ll talk about it later” approach and demand more immediate action. Climate change is becoming a bigger problem faster than we can react to it. Economic inequality has reached historic levels. Awareness of the problem is not enough, nor are demands for accountability from fossil fuel companies.